Dian Nuswantoro University (Udinus) once again got an achievement in academic field in national level. Last November, Audicreate team from Udinus won as the 3rd winner in Audicreate category in the Audit Olympics for the State from Audit Board (BPK) of the Republic of Indonesia. Udinus sent 16 students to this Olympic which had several categories. 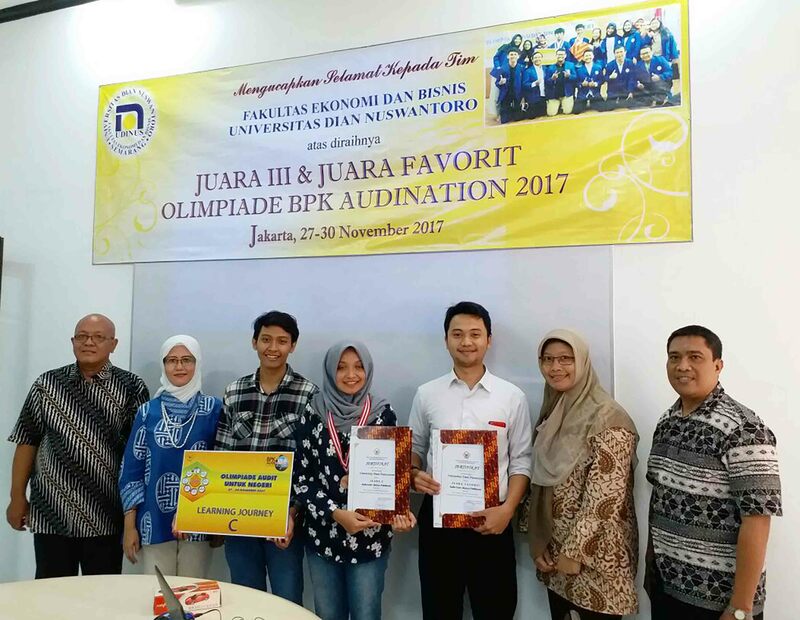 Olympic Auditing was a series of competition for both public and private Universities throughout Indonesia which related to auditing courses. There were seven categories in this Olympic such as Audishare, Audesign, Auditisme, Audiknow, Audea, Audirace, and Audicreate. 1 of 16 teams from Udinus won as the 3rd winner in Audicreate category. Audicreate is an innovation or publication work which related to BPK RI. Udinus’ Audicrete team was consists of Aulia Robertco Bhirawa Nagora from bachelor degree of Design Communication Visual Study Program, Nurul Khasanah from Bachelor Degree of Accounting Study Program, and Guruh Angkasa P from Bachelor Degree of Management Study Program. Besides won as the 3rd winner, Udinus also managed to become the favorite champion in this great event. "Our team produce 3 products such as posters, infographics and animation about BPK RI, we prepared everything for less than a month," explained Guruh a member of the Audicreate Team. The preparation was about the collection of materials and the latest info of BPK RI, the students were very diligent to consult this things with the mentors. The Olympics was held on 27th until 30th of November 2017 at Wisma Pusdiklat BPK RI Jakarta. This national level Olympic was the first Olympic held by BPK RI. It was noted that there were 96 universities with 1340 participants in total participated in the event.